There’s no better spy story than a true spy story. The Assets miniseries now playing on Netflix tells the real story of a mole hunt within the CIA, a hunt that started in 1985 and took many more years than it should have to find the guilty culprit. Although I didn’t find Jodi Whittaker (BBC’s Broadchurch) to be the best choice for playing officer Sandy Grimes, she did a decent job despite her unnatural-looking blond hair, and the teenage-like tantrums that may have been more the fault of the writers/directors than the actor. 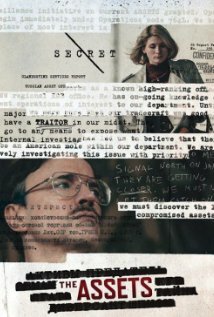 Paul Rhys (Borgia) was perfect as cocky-yet-geeky traitor Aldrich Ames. Has ever a man been so obviously influenced by a love interest? What keeps The Assets compelling is that it bounces between the CIA offices, the Russian assets they are recruiting, and Grimes’s difficulty balancing her secretive work with family life. Themes running throughout the miniseries cover bureaucracy/institutionalism vs. doing the right thing, how the definitions of “traitor,” and “hero” change depending what side one is on. Based on the book Circle of Treason by Sandy Grimes and her colleague Jeanne Vertefeuille (a wonderful performance by Harriet Walker), the series indicates that were it not for the persistence of these two women, Ames would have never been caught because the heads of the CIA didn’t really seem to care. Chilling, if true, and a stark contrast to the KGB that is shown taking great pains to weed out any possible traitor in their midst. Indeed, the scenes showing the fates of both the US operatives in Russia and their assets are the most compelling in the series, revealing just how sinister Ames’s actions were. These women and those on their team are to be commended for their bravery and persistence in pursuing the truth. The last few scenes had me in tears as truth won out. On the positive side, both Diane Sawyer and Ted Koppel both have obvious contempt for Ames and his wife in their interviews. Also, it is highly embarrassing that Ames was allowed to get away with his treachery for so long, and it is remarkable that he was actually caught, and equally remarkable that the CIA did not appear to foresee such a threat. Sandy Grimes’s obvious delight in the truth and seeing Alrich sentenced is also refreshing in a society that puts increasing emphasis on sympathizing and understanding evildoers, instead of stopping them. It’s also refreshing to see communism portrayed correctly as an undesirable type of government, an ideology that spouts love for the common man and for freedom, but always turns out to be the exact opposite. Communism is merely one side on the die of totalitarianism, just like socialism, fascism, and progressivism. All four ideologies are touted by those who believe that those in power know better than the common man (incidentally this thought usually begins with a hatred of both morality and Christianity) in how to run their lives, whether it be seeing the common people as too stupid or too poor to take care of themselves, or both. These are not friendly ideologies, but sinister ones that lead to death camps, eugenics, euthanasia, abortion, mass executions, and the like. All four ideologies are summarized by a flagrant disregard for human life, especially the lives of those most vulnerable in society, and many in service to them are revealed in history to be some of the worst murderers and torturers that the world has ever seen. Most chilling is the institutionalization of murder where barbaric acts are seen as “civilized,” and desirable in an “enlightened” society. The barbarism doesn’t often happen overnight, but takes a number of years to be engrained, for any resistance to the idea that some human lives are worth more than others, needs to be quietly stamped out, as most people’s consciences initially object to such a thought. Another side to the die, is Islamism, a system that is just as totalitarianism as the others, and currently a more immediate threat to the West, though the others aren’t far behind as the people of the West increasingly look to governments for their daily needs and tell themselves that if something is “legal” it must be “right.” Western people condemn Christianity and Judaism for “judging,” but happily defend and embrace a religion for more censorious and dangerous. It’s nice to watch a story in which good and evil are not swapped, and a story in which ordinary people are revealed to be the most capable in caring for the welfare of their fellow citizens. It’s also of note for any ideology, capitalism included, that some will always want for more money/power, and will do anything to get it, even if it involves taking lives, thus the unwillingness of the CIA to understand that a traitor was in their midst.